WHY AUCTION? POINTS FOR SELLERS. You receive the true market value of your assets. Market value is what you can actually receive in dollars and cents on a certain day in a certain locale. The Good Stuff, the Bad Stuff and the Ugly Stuff, at auction you can sell it ALL! It allows for closure of that period of your life. It’s time for you to move on to the next stage of your life. We can usually handle the whole process once we have a contract. NOTHING for you to worry about. a. Estate- Real estate, personal property, equipment, vehicles, virtually anything can be sold. a. Check their references and ask lots of questions. b. How many and what type of auctions do they do each year? c. Exactly what does the commission pay for? d. Who pays for the clerk and cashier? e. How and where is advertising placed and at what cost? f. Who provides set up labor and labor day of sale? g. How about moving? Or storage costs? h. Is food and drink available for the buyers? Who sets that up? i. Are there restrooms? Is there an extra charge for these? j. How about weather protection? k. Who pays building rent? GET A WRITTEN CONTRACT DETAILING ANY AND ALL COSTS. A Contract should explain who pays for what and helps eliminate surprises. Any questions or concerns, ASK—BEFORE signing. Beware of empty promises….. Too good to be true? It probably is! Arrive early at the sale site. Allow time for inspection, look closely and rely on your own inspection. Listen and learn from other people in attendance. Is the auction company well spoken of? Is the merchandise what you think? Register for a bid number. Be prepared to show license or ID to get your number. Keep control of the bid number, you are responsible to pay for items bought on that number. Before the sale, talk to the auctioneer or workers, ask questions, let him or her know your interests, they are here to help. Do NOT rearrange items on tables or items in box lots. Sometimes the items may belong to different sellers. Inspect the items closely that you are interested in bidding on. It helps to set a price in your mind that you are willing to pay for that item. It may be worth more to another bidder. Look after the items that you buy, if they are handed out to you. In some cases they are put in a restricted area, and must be paid for before you can pick them up. But oftentimes they are handed directly to the buyer. YOU are responsible for the items after they are sold to you. Don’t think that a wink or scratch will be taken for a bid. Wave your bid number to get the auctioneer’s attention, then you can shake your head to indicate that you want to bid again. 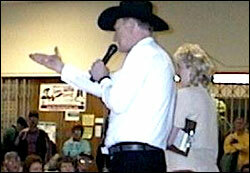 If you aren’t SURE that the auctioneer has seen you…SHOUT.. .JUMP UP & DOWN.. ..WHISTLE… .WHATEVER IT TAKES ! We do NOT want to miss your bid! If we miss your bid, then you are unhappy, seller is unhappy, and we are unhappy as every bid we miss is less money for our seller and in turn our company. BUYING AT AUCTION IS AN ORAL CONTRACT! -- This contract means that you agree to pay for the item for the final bid that you placed. When the auctioneer announces your number as the buyer and you do not disagree, you are bound by contract to pay. Be sure and pay the cashier before you leave the auction site.